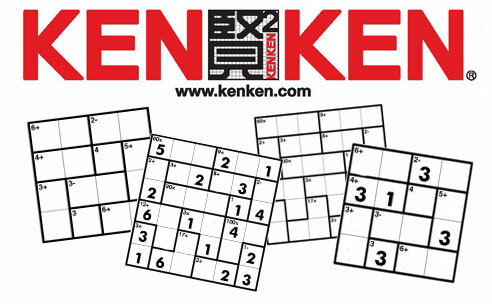 KenKen is the hottest puzzle craze since Sudoku. It combines the logic of a Sudoku puzzle with arithmetic. You have to add, subtract, multiply and divide to arrive at the numbers given in KenKen puzzle. In KenKen, like Sudoku, there is a grid of 4×4, 6×6, 8×8, or 9×9 cells. That means the grid has 16, 36, 64 or 81 cells. The puzzle can actually be even larger, but those are for really advanced solvers. In both kinds of puzzles, you must have all the digits in one row. In other words, if a row has 4 cells, like in a 16-grid puzzle, you must use the numbers 1-4 in each row, and in each column. No digit may be left out of row or column, nor may there be duplicates in a row or a column. So far, that’s totally easy to understand. If you look at a puzzle, you can see what I mean in a second. some adjacent groups of cells have a thick border around them. Those groups are called “cages.” Each cage has a number printed in it, along with an operation sign. The cells within that cage must be filled with the digits that will amount to the number given. Let’s say the cage has two cells surrounded by a thick border, the number in it is 6, and the operation sign is multiplication (x). That tells you that you must find two numbers that multiply to 6. You may be tempted to say, “That’s easy. 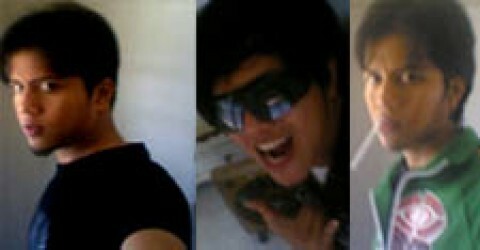 The answer is 2 x 3!” But don’t jump to conclusions! The answer could just as well be 6 x 1. Furthermore, you don’t immediately know which of the two cells the 2, 3, 6 or 1 belong in. You have to find that out from looking at the other cages and narrowing down your possibilities. It takes about two minutes to learn how to do KenKen, but it can take years to master. There’s something for all levels of solvers. Once you understand how KenKen really works, you will start learning all about factoring, exponents, and mathematical logic. You won’t need a workbook, and there are no grades (if the teacher is smart). The only stress is the gentle strain on your brain, and you’ll be developing that brain with every KenKen puzzle you solve. It’s easy to get good at KenKen with some practice. The nice thing about the practice is that you won’t be able to stop. KenKen is the most addictive puzzle around! Imagine a student being able to hone his or her basic math skills without worksheets, flash cards, charts, rote-memorization, or quizzes. Imagine that student loving math like never before! KenKen was invented by Tetsuya Miyamoto, a Japanese math teacher who says, “I believe that if you give children good learning materials, they will think and learn and grow on their own.” If you teach yourself, your child or your students basic math with KenKen, they will develop a lifelong love of mathematics, and you will have done them a wonderful favor.